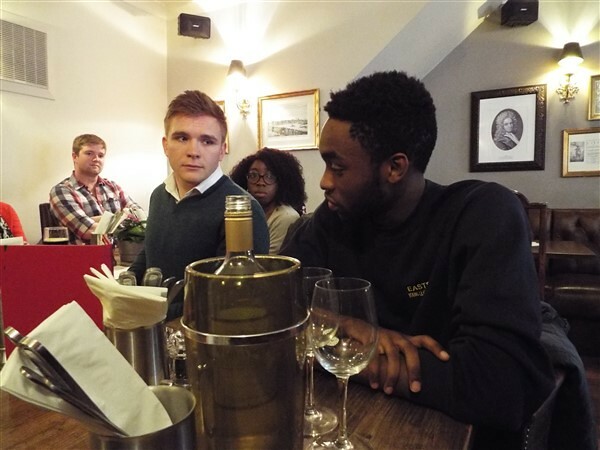 Arnold Foundation Ambassadors gathered recently at The Globe in Moorgate; this annual get-together provides an opportunity to catch up, swap stories and discuss ways in which they can continue to support the Foundation. The warmth with which they speak about both the School and Arnold Foundation was very evident, as was their continuing gratitude to those who had given them the opportunity of a Rugby boarding education. Of the group attending, Agnes Traore (St 10-12) is now in her final year studying nursing at Cardiff University and has been made President of Nurse Soc, the course related society. She had recently been interviewing Welsh MPs on healthcare issues on local TV. Lewis Taylor (M 07-09), who had trained as an auditor at Ernst and Young, has now joined the Royal Mail. He was embracing the opportunity working in a smaller team offers and the chance to make a difference in an organisation undergoing significant change. Others are continuing to apply themselves to their studies, with a number due to graduate this summer. The process of applying for graduate positions is well underway, with entrepreneurial ideas also coming to the fore. We post another update in the Summer E-newsletter.